View Campaign This campaign will close on Aug 12, 2016. 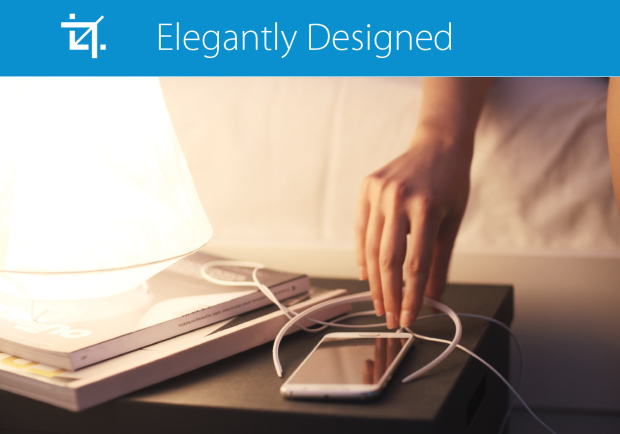 The ELF emmit emits pulses from 2 Hz up to 19 Hz—nothing beyond the natural rhythm of the mind. 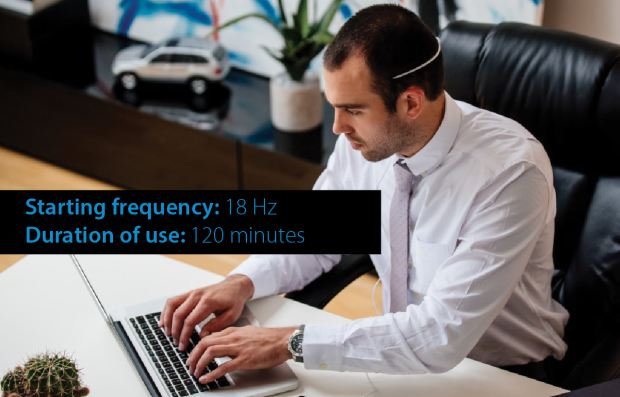 Each of its (5) mood settings emits extra-low frequency pulses that are optimized to target the cerebellum, gently coaxing your current brainwave frequency to speed up or slow down and match your desired mood. Our brain’s ability to transition through these frequencies determines how successful we are at managing stress, focusing & getting a good night’s sleep. Synchronize your mind and body. The only wearable using cutting-edge neuroscience to guide the natural frequencies & rhythms of your mind. ELF emmit uses non-invasive and FDA Approved technology to actively influence positive change in your daily life by emitting pulses at specific frequencies, optimized to attain a desired state of mind, at any given moment. This FDA Approved technology known as Pulsed Electromagnetic Stimulation (PEMS) has nearly 50 years of medical/neurological applications and scientifically-proven health benefits, with it’s origins dating back to ancient times. Until now, similar technological devices were big, heavy, expensive and not convenient for daily use. We’ve adapted this technology to make a product that is wearable daily and affordable to everybody. All humans display (5) five different types of electrical patterns or “brain waves” across the cortex that can be observed with an EEG (electroencephalograph). Your moods – whether you are relaxed, focused, stressed, tired, or distracted – are directly tied to the electrical activity in your brain. Your mind and body are often at odds with the tasks you are trying to accomplish. When we’re focusing hard, our brainwaves spike up to 30 Hz per second. 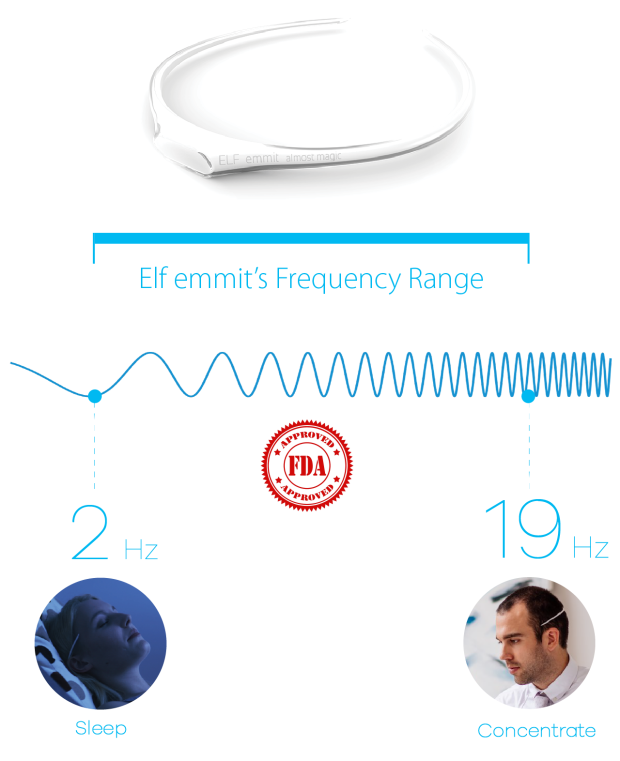 The ELF emmit emits pulses from 2 Hz up to 19 Hz—nothing beyond the natural rhythm of the mind. Our brain’s ability to transition through various brain wave frequencies plays a large role in how successful we are at managing stress, focusing on tasks, and getting a good night’s sleep. 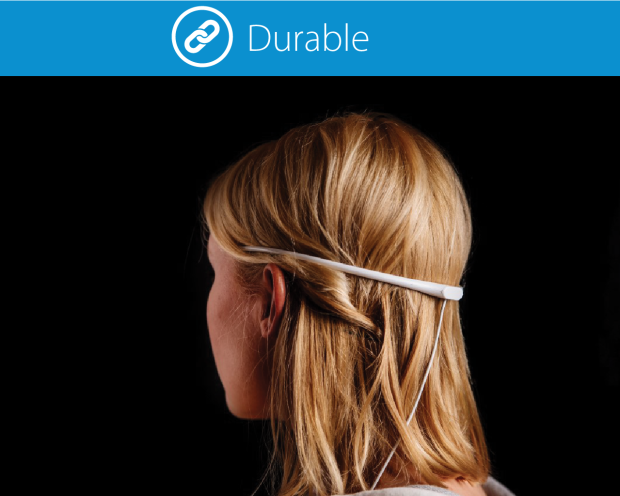 The ELF emmit contains an electromagnetic coil, allowing it to emit extra-low frequency electromagnetic pulses complementary to the brainwaves your body already produces. These pulses target the cerebellum, gently coaxing your current brainwave frequency to speed up or slow down and match your desired mood. Each of ELF emmit’s (5) mood settings emit pulses at a specific frequency, optimized to help you attain and transition to your desired state of mind. The ELF emmit emits pulses from 2 Hz up to 19 Hz to coax your desired brainwaves along—nothing beyond the mind’s natural rhythm. The quick pulses of ELF emmit’s Concentrate Mood multiply your ability to problem-solve, to process information, to multitask and to remain focused and alert. The Beta waves this mood promotes are very fast (high frequency, low amplitude) brain waves that most people exhibit throughout the day in order to complete conscious tasks such as critical thinking, writing, reading, and socialization. They tend to have a stimulating effect. Having an appropriate level of beta waves allows us to focus and complete school or work-based tasks easily. When you drink caffeine or have another stimulant, your beta activity will naturally increase. ELF emmit’s Anti-Stress Mood induces alpha brainwaves that help to calm you down, inducing a peaceful state of mind. This frequency range bridges the gap between our conscious thinking and subconscious mind, or between beta and theta. It helps us calm down when necessary and promotes feelings of deep relaxation. If we become stressed, a phenomenon called “alpha blocking” may occur which involves excessive beta activity and very little alpha. Essentially the beta waves “block” out the production of alpha waves, because we are too agitated. ELF emmit‘s Deep Learning Mood induces a state similar to the one we achieve just before we fall asleep and just after we wake up, increasing your ability to learn and retain knowledge by a huge degree. 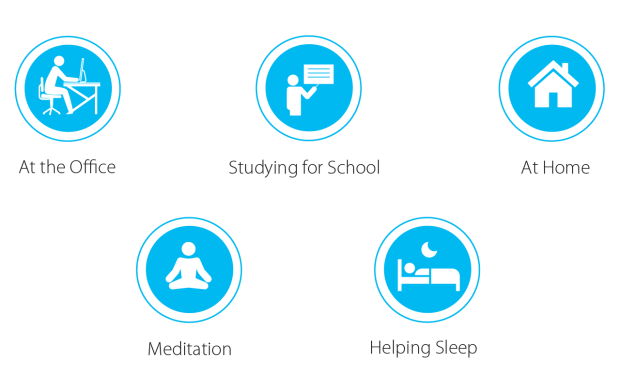 Induce a state of learning at anytime, increasing your ability to learn and retain knowledge up to 4 times. These waves are important for cognitive functioning, learning, memory and information processing. Thought processes for learning are most flexible when the mind is tuned from beta to alpha state. ELF emmit’s Meditate Mood induces a predominance of theta brain waves, which enable you to control your mental processes and optimally balance all your cognitive functions. Theta waves are connected to us experiencing and feeling deep, raw emotions in a deeply relaxed, semi-hypnotic state. A predominance of theta waves boosts our intuition and creativity, and makes us feel more natural. It is also involved in restorative sleep. As long as theta waves aren’t produced in excess during our waking hours, they are a very helpful brain wave range. ELF emmit’s Sleep Mood induces a predominance of delta brain waves, the slowest band it stimulates. With delta brain waves dominating, your body rests, its functions rest, and your immune system is boosted. These are the slowest recorded brain waves in human beings, found most often in infants and young children (they sleep a lot) but as we age, we produce less, even during deep sleep. Delta waves are associated with the deepest levels of relaxation and restorative, healing sleep. Adequate production of delta waves helps us feel completely rejuvenated after we wake up from a good night’s sleep. Our emotions and other external stimuli can cause our mental frequency to shift, disrupting our ability to function as we might like. ELF emmit encourages this frequency to get back in line with the task at hand. Your moods – whether you are relaxed, focused, stressed, tired, or distracted – are directly tied to the electrical activity in your brain. 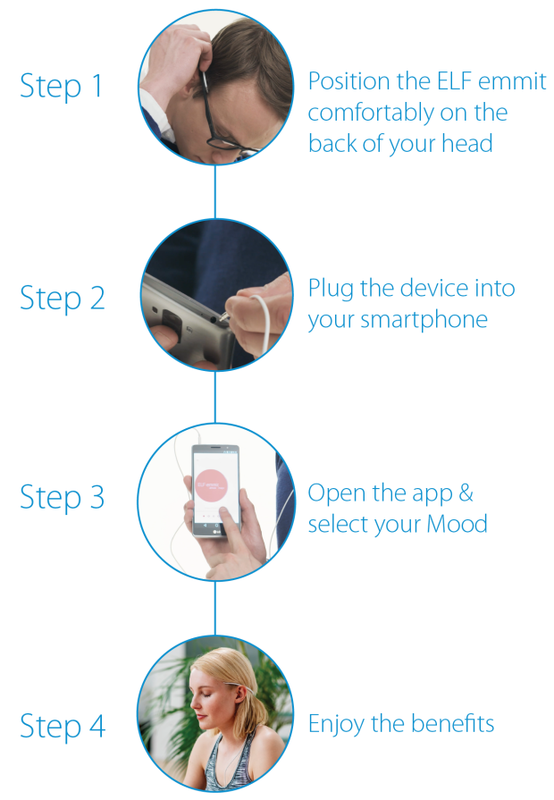 Powered by your smartphone and using a free app with an easy to use interface, ELF emmit can help you train your brainwaves to sync up with the mood you want to reach. Choose a mood in the free mobile app, and ELF emmit will start to work. With repeated use, your brain will grow accustomed to the stimuli ELF emmit produces and adapt more and more quickly. For many, it is difficult to imagine taking the time to relax, to light a fire in your hearth and just sit and watch it, to meditate, to ride a train and fall asleep to the smooth sound of turning wheels. Playing drums or meditating in the middle of the office seem equally unimaginable. The ELF emmit offers an alternative solution. The PEMS technology used in the ELF emmit has been approved by the FDA for medical applications, and is completely safe and non-invasive. Running at 3.4 millitesla (mT), a measurement of magnetic fields, the ELF emmit is totally harmless. It is just powerful enough to be recognized and responded to by our brains. ELF emmit uses simple construction without many moving parts and is built from resilient poly-carbonate and thermoplastic. It will stand the test of time, even with repeated daily use. Expertly designed in a slim, elegant headband, the ELF emmit is equally at home in your place of residence, the office, or anywhere else. While most devices utilizing PEMS technology are bulky, heavy, and require a power outlet to run, the ELF emmit weighs just .7 ounces and gets all its power from your headphone jack. It is light enough to be taken wherever you go and be worn all day or night. ELF emmit’s software is entirely open source. Right now, students and their professors as well as expert specialists are working on new and exciting applications for the system. In addition to developing our own new programs, we’ll carefully check any that are sent to us and add them to the app if they really do work. In the past, people used extremely low frequencies to achieve altered states of consciousness. Meditation along with the rhythmic sound of drums, gong therapy, or steady flashing lights can all transport you into a state of thoughtfulness and transcendence. Even the sound of rolling wheels when riding a train can put us to sleep. The brain reacts to every color, voice, sound, loved one, and dissatisfaction. The ELF emmit taps into this reaction, blending the traditions of the past with the technology of the future – wearables grounded in neuroscience. It uses state-of-the-art extra-low frequency pulsed electromagnetic therapy to naturally and non-invasively optimize the performance of your mind and body. Our minds and bodies run at different speeds, depending on what we are doing. Problems arise when, because of upper impact interference, your brain frequency is not aligned with what you are trying to do or to achieve. We have all experienced how fear and stress inhibit you from thinking clearly and concentrating. Don’t forget what happens to our concentration when we are in love! We may feel great, but we’re in big trouble if we have to concentrate on something other than the object of our affections. In the same way, external electrical frequencies, not aligned with our brain frequencies, can disrupt our ability to function as we might like. These emotions and external stimuli cause our brain frequency to swing sharply, and our level of concentration moves along with it. Unfortunately, we are not all yoga gurus, able to balance ourselves through meditation, wherever we find ourselves. Imagine if you could rewire your brain to connect a situation to the mental state that best suits it, by choosing yourself. That is what the ELF emmit will help you achieve. Is your video available in other languages? Yes it is! We currently have the video localized into Arabic, Chinese, German, Hebrew, Hindi, Japanese, Korean, Russian, Spanish, and Swedish. What is ELF emmit made of? ELF emmit is made of non-allergenic plastic. It is smooth, flexible and completely latex-free. 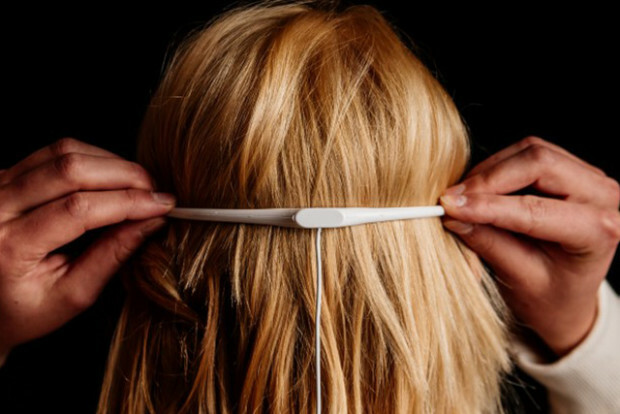 Designed as a headband that rests just above your ears, wrapped around the back of your head, it contains sophisticated technology. Please treat your ELF emmit with care and avoid unnecessary bending. Let it become your personal assistant for many years to come. How can I clean my ELF emmit? Clean the exterior of your ELF emmit device with Isopropyl Alcohol or alcohol-based sanitizer applied to a cloth or cotton swab. Do not submerge the device in any liquids. Is ELF emmit a safe device? Of course! We’ve created ELF emmit as device that relies exclusively on natural extra-low frequency electromagnetic pulses, which are complementary to the chemistry and functions of the body. It is entirely non-invasive and completely safe. 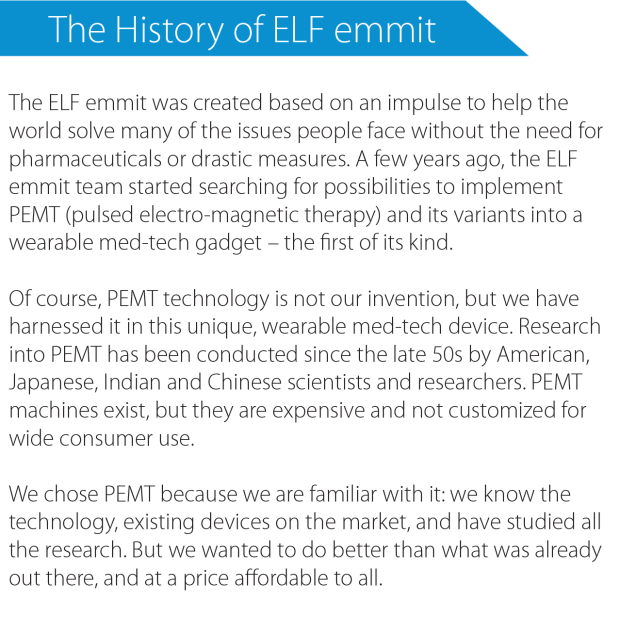 ELF emmit doesn’t require a FDA approval, as it’s not considered a medical device. But the scientific principle on which it is based, PEMT (pulsed electromagnetic therapy) is FDA approved. Why is ELF emmit a headband? Low frequency electromagnetic pulses that ELF emmit produces penetrate through the body. However, the intensity decreases as the distance grows from the target area: the brain. That’s why we designed ELF emmit as a headband. Can I wear ELF emmit for a longer period? Yes. But we recommend you to follow the user guide instructions. Why? Because using a single frequency longer than necessary may lead to loss of a benefit previously experienced. It’s like entering a room full of flowers. After a while you get accustomed to the scent. How can I charge my ELF emmit? 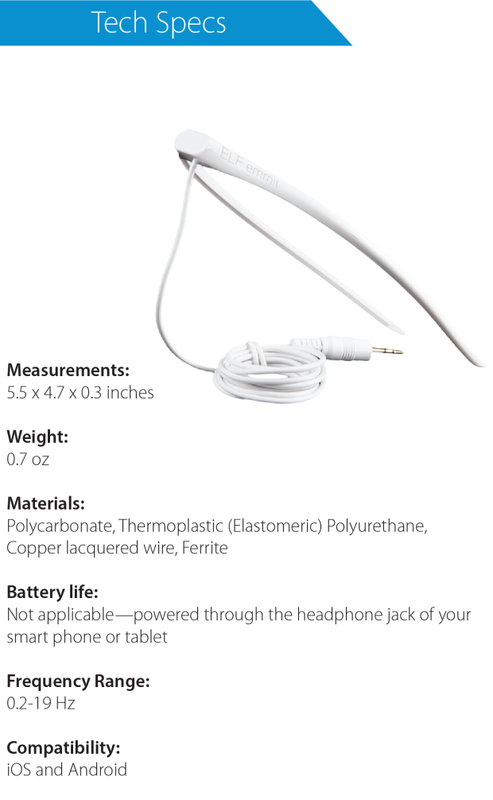 ELF emmit uses your mobile phone or tablet as its energy source, plugged in via the headphone jack. As long as your phone or tablet is charged, ELF emmit is charged, too. What are the benefits of my ELF emmit being powered via the headphone jack? This system offers a safety guarantee—if you are comfortable wearing headphones, which get their power from the headphone jack, then you’ll be just as comfortable wearing the ELF emmit, as the same, entirely harmless, amount of electricity powers both. This also allowed us to make the ELF emmit as slim and lightweight as possible, since it does not need to contain a bulky battery. How does the ELF emmit smart phone application send information to the device? 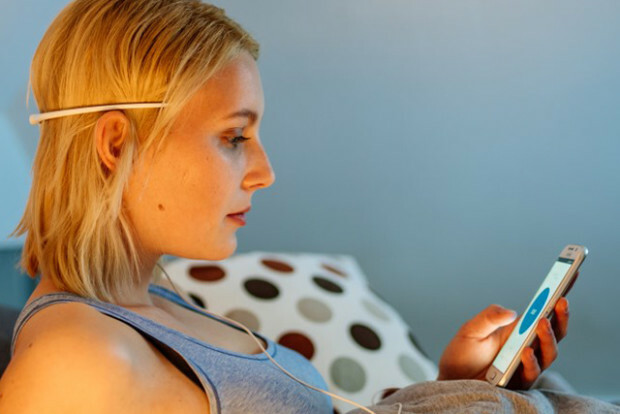 The ELF emmit application communicates with the ELF Emmit device via the cable, which plugs into the headphone jack of your tablet or smartphone, and which likewise powers the device. Can ELF emmit get wet? ELF emmit is water resistant, but not waterproof. It will do well through the normal day-to-day use, but please don’t go scuba diving with it. 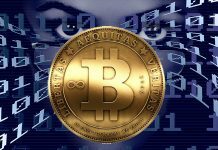 Do you protect my privacy and how? Can I become a domestic or international dealer of ELF emmit? Of course. We strongly support this idea of yours, and will help you as much as possible! To apply, please email us. You will receive an email confirmation and shortly thereafter our marketing team will contact you and walk you through the process. What technology does ELF emmit use? It uses PEMS (pulsed electromagnetic stimulation) technology that naturally changes the predominant brain speed pattern. Our bodies are electrical and chemical: every heartbeat generates electromagnetic pulses that chemically stimulate tissues and cells. ELF emmit encourages the brain to produce a certain rhythm that best suits the state of mind you’d like to be in, with the use of low frequency electromagnetic stimulation. Uh, what’s PEMS technology, again? Brain frequencies are produced by masses of neurons communicating with each other, changing according to what we are doing or feeling. Different brain frequencies result in different states of mind. PEMS technology uses very weak electro-magnetic impulses in extra-low frequencies, to encourage our mind to work at a speed we choose, to best perform the task at hand. In the same way that meditating along with the rhythmic sound of drums, gong therapy and steady flashing lights all transport you into a state of thoughtfulness and transcendence, PEMS can guide your mood. Is the efficacy of PEMS scientifically supported? Yes, it is! The concepts behind PEMS technology have been around for millennia. The ancient Greek physician, Galen, wrote about the healing properties of magnets back around 200 BC, and it has always been a staple of Chinese medicine. Even in the US, it was used widely until 1908, when a medical report by physician Abraham Flexner dramatically changed the way America medicated, leading to a shift towards an almost complete reliance on pharmaceuticals over other, less-invasive treatments. There are several variations on this therapy such as PEMF (pulsed electromagnetic field therapy and PEMT (pulsed electromagnetic therapy). PEMS, PEMT and PEMF have a rich history in the US, as well as FDA approval. Magnetic therapy was marginalized in the US until the early 1970s, when a Dr Friedenberg published his findings that electromagnetic field therapy helped certain types of bone fractures to heal more quickly than similar fractures in patients who were not exposed to this treatment. This was expanded by Dr Andrew Bassett of Columbia University Medical Center, who in 1974, found further success in treating non-healing bone fractures and pseudarthroses, with the use of low frequency electromagnetic signals. In 1979, the FDA approved the use of electromagnetic therapy for fractures. A decade later, the FDA approved its use for treating pain and edema. In 2011, transcranial magnetic stimulation received FDA approval for treating depression, and for treating migraines in 2013. ELF emmit draws on this long, rich history of the scientifically-proven success of electromagnetic therapy. Do I need to be at a certain place to use ELF emmit? Not at all. You can use it anywhere. All you need is a tablet or smart phone to choose the working mode. Can the ELF emmit improve my general health? Absolutely! ELF emmit can help reduce stress, improve concentration and aid sleeping. How does ELF emmit influence my body? 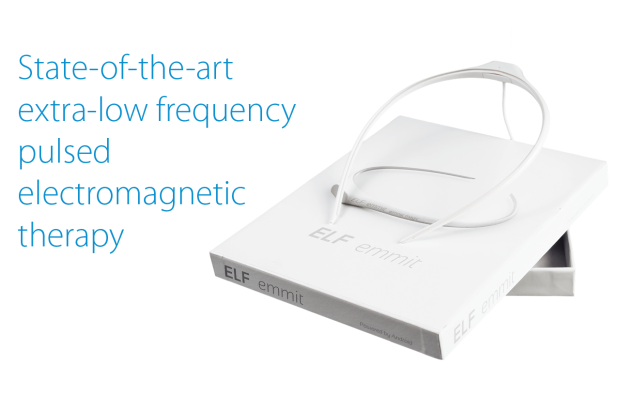 ELF emmit produces low frequency electromagnetic pulses that gently encourage your brain waves to join in with the chosen frequency of the pulses. With regular use, your brain will quickly synchronize with your chosen state of mind, thanks to ELF emmit acting as an intermediary. Will I feel the effects right away? 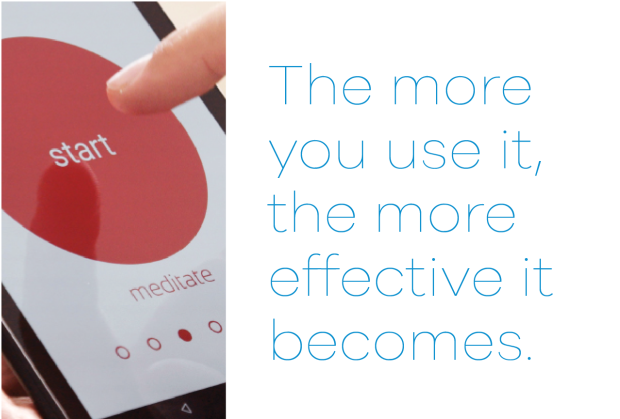 You will not feel the effects the instant you turn on the device for the first time. 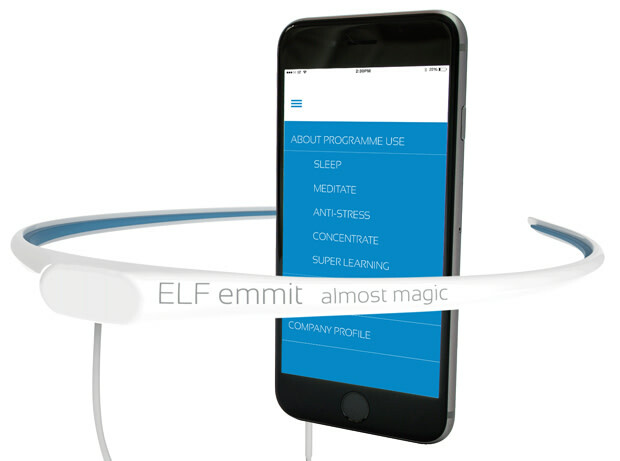 ELF emmit trains your brain, rather than suddenly altering it the moment you first turn it on. We recommend regular use for at least a week, at which point you will certainly notice a difference. The brain takes a bit of time and practice to synchronize with the pulses produced by ELF emmit. Once your brain has been trained to sync with ELF emmit, you should feel results immediately and regularly when using it. Can I use ELF emmit too much? No. Low frequency electromagnetic stimulation has minimal-to-no effect on healthy cells. Actually it seems to be ignored by cells that are in optimal condition, balanced and in no need for extra energy. Use it as much as you like, but only when you need it. 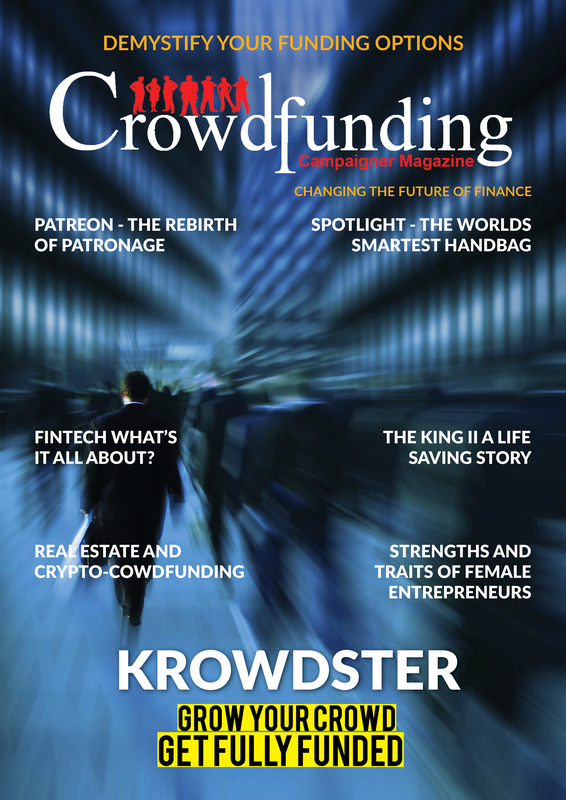 I was told electromagnetic waves produce “electro smog,” and that this is a bad thing. Electro smog comes from devices with particular field strengths and high frequencies. These frequencies can induce heat in tissue and potentially damage cells. Our technology is based on carefully-selected low frequency stimulation that is non-invasive, natural, and does not create electro smog. No worries. Does ELF emmit work with iOS and Android? Yes. ELF emmit works with both iOS and Android. 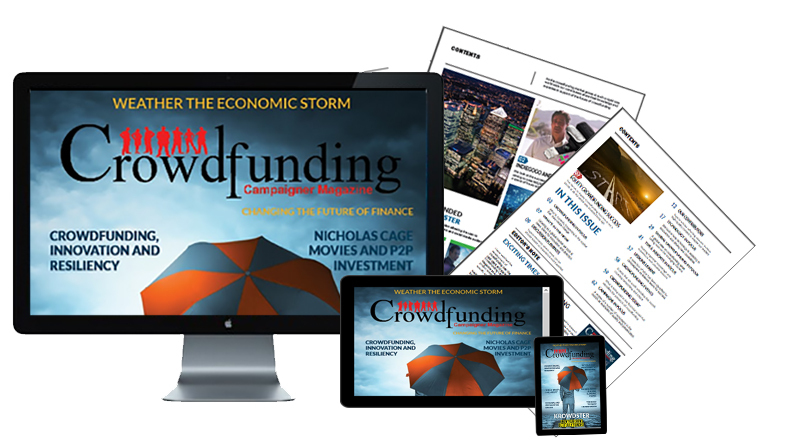 The application is available both in Google Play and the Apple Store. What devices are compatible with ELF emmit? Most smart phones and tablets are compatible with Elf emmit. Is there a web application? We do not have a web application at this time. The ELF emmit application is absolutely free. How can I tell that it’s on and working? The electromagnetic pulses produced by ELF emmit have no physical sensation on the skin, which is one of the reasons it’s so non-invasive, comfortable and easy to use regularly. Plugged in, and with the app running, the ELF emmit is working—the screen will dim, and the text will indicate that the device is working. The app is designed to tell you if there is a problem and the product is not functioning. Is ELF emmit recommended by health professionals? Yes, it is. Although ELF emmit is not a medical device, and does not substitute for medical advice or doctor’s appointments, health professionals endorse ELF emmit and believe that it contributes to better overall health, primarily through decreasing stress, increasing concentration and improving sleep. Is ELF emmit a medical device? No. ELF emmit does not diagnose or cure any health condition or problem, so it is not officially considered a medical device, though it can contribute to better overall well-being and an improved lifestyle. Yes, we do, and all shipping charges are covered when you back our project.